Hello again! 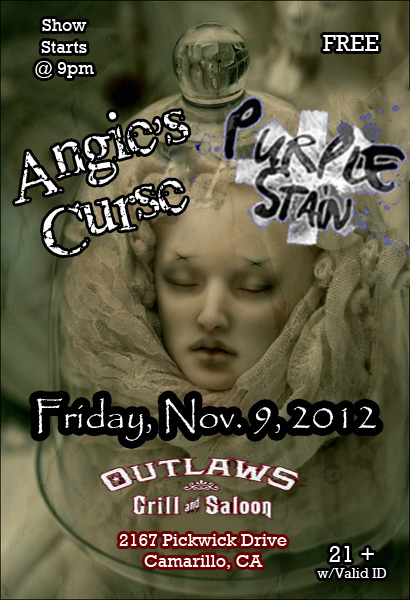 We’ve recovered from our Halloween madness and are ready to rock out with our goth out. TONIGHT – we have been asked to play at Outlaws in Camarillo, opening for Purple Stain, a great Red Hot Chili Peppers cover band. It’s 21+ and free. We go on at 9pm. Next week is the big Semi Finals showcase on November 16th at Bombay’s RAW Artists Ventura Best Music Artists. If we win this thing that means Angie’s Curse goes to the nationals! We will be launched to a whole ‘nother level! Voting takes place AT THE VENUE so please get your tickets today, come out, watch us kick goth a$$, and vote us into the big time.